Just in time for Halloween! 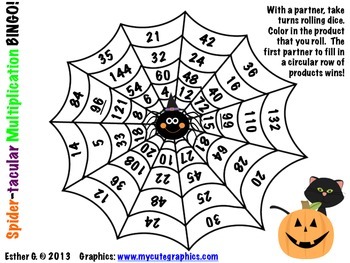 This fun bingo game allows your students to practice their multiplication facts. It's perfect for the week before Halloween, or on the holiday itself! You'll need 4 dice per partnership (or two 12-sided dice). Each partner will roll 4 dice to create a multiplicand and a multiplier. For example, if I rolled a 3, 4, 2 and 6, and would add the 3 and 4 to create 7, and the 2 and 6 to create 8. My multiplication problem would be 7 x 8. I would color in 56 on the web. The first partner to color in a circular row on the web is the winner!